I carry a Coach purse and I love it. I’m ridiculously proud of it and I walk with it front and center, to the point where it looks as if I am hiding an unwanted pregnancy; I tend to show it off when I walk into upscale grocery stores, not that I ever really walk into upscale grocery stores, but if I did, I would proudly show off my Coach bag. I take it into the local IGA and the cashier doesn’t notice its glory, but I flaunt it just the same. 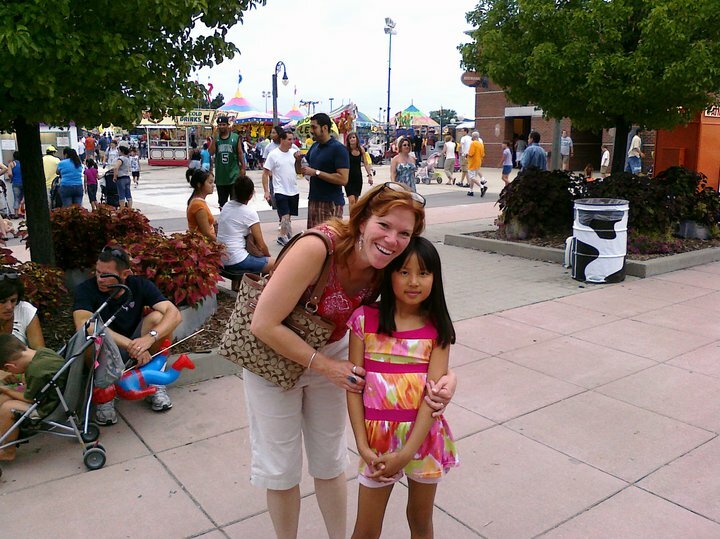 Eight years ago, I knew nothing about Coach handbags. That is, until my sister-in-law started working for Coach, then I started getting a bag every Christmas. Now I loves me some Coach. Sure, I carried purses before my love affair started. Even now, I carry “normal” purses to “normal” places. They’re sad looking bags with no satin lining or tell-all leather signature tag. I rationalize this by thinking that I don’t want to get my good bags dirty. You don’t wear an evening gown to the post office, right? Even Emily, my daughter, occasionally puts down the plush upscale “Webkinz” stuffed animals to play with the old, “carnie” stuffed turtle she got when the dart somehow managed to find the balloon. She feels bad for it if she ignores it for too long. “It gets jealous of all my other friends,” she whispers. I too feel bad for my discount pink faux-leather bag I got at Walgreens. I drag it out on occasion for pity’s sake. There is an exception here, however. There is one bag I keep out of rotation. It is hidden WAY back in my closet. I never bring it out for fear Emily will see it. 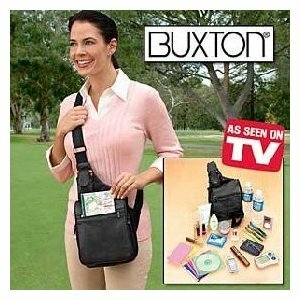 A few years ago, TV was inundated with commercials for a Buxton bag, no, not a bag – they called it an organizer. 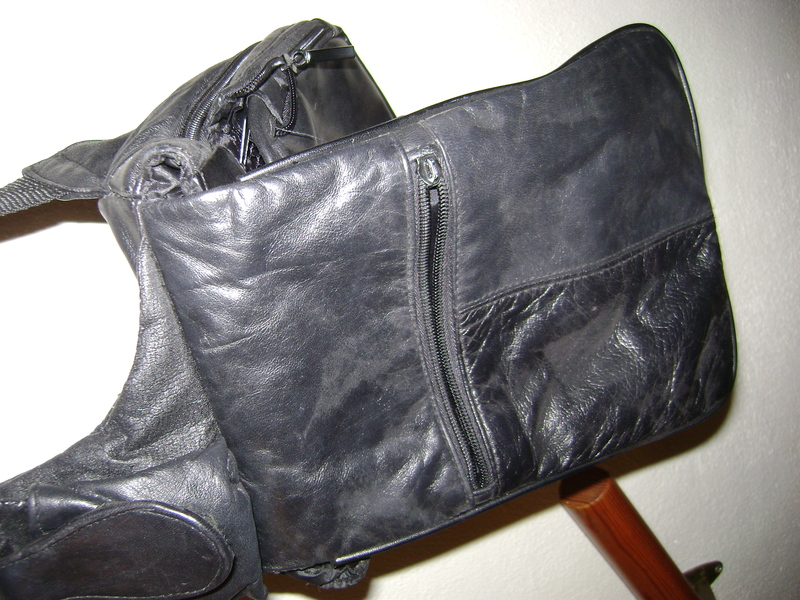 It was a thin, pleather thing with an over-the-shoulder strap so you could wear the bag on your hip. There was a big, wide strap cutting across on an angle, like some military sash gone horribly, horribly wrong. The “amazing” part about this bag, which they stated over and over again in the commercial, was that it could actually get bigger as you needed, due to the hidden zippers. At one point, it actually showed a woman (wearing a blindfold for some reason which escaped me) putting 6 bottles of water into that ugly, little bag. The problem with purses for me is that with every passing year, the purse tends to get bigger. In my 20’s, I carried a little, cute clutch; now it seems, I have a bag five times the size of my head. I hate having a big purse, I do, but I can’t seem to stop myself. At this rate, I will be dragging around a plastic lawn bag when I hit my 60‘s. Every year I try to “downsize” but it’s pointless; there’s always way too much stupid crap I think I need; that by shoving all my useless stuff into a smaller purse will somehow make it easier, but no. It just means I can’t close the zipper. 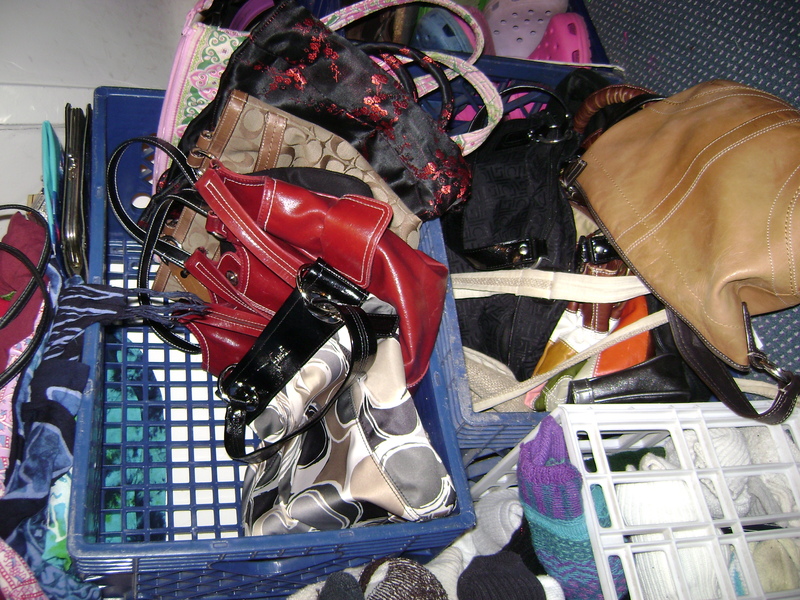 In my home, I will ardently throw something out if I don’t use it within a calendar year; I’m GREAT at purging stuff in my house, but with the guts of my purse, I’m a hoarder. I have gum from 1976. Normally, I have to take out 70% of the useless crap that is in my purse in order to find what I am looking for, which is always 1 of 3 things: my phone, my planner or my wallet. That’s really all I ever use in my purse, so why then do I need a bag the size of Rhode Island? -1 big pair of sunglasses. (Also, a gift from Solvieg.) As my purse gets bigger as I age, so do my sunglasses. The big purse helps to hide the big hips, the big sunglasses helps to hide the big crow’s feet. -Check book that is woefully out of date; I think it was balanced once in the 80‘s. That’s it. That is the contents of my very large purse. I was digging for something (probably my phone, my planner or my keys) and swearing like a sailor, when Kriner stated, “It must be sad to be a little purse woman trapped in a big purse woman body” I told him it really was. Ironic…I’m a big purse woman trapped in a little purse woman body! That means that the overflow is in my car, which means that I now get in my purse and drive it around.